Mirlitons can be prepared in a few different ways, this is my favorite. When served as part of a meal, usually 1 whole mirliton will feed two people. Slice mirlitons in half and put to boil until fork-tender. Don't over do them because if the skin gets too tender they will fall apart when working with them. If using ground beef, brown it and drain off the fat. If using shrimp, dice them up and sprinkle a little Creole Seasoning on them and mix them around. Sauté onions, celery and bell pepper in oil for about 15 minutes until soft, add garlic and cook for another 5 minutes. When mirlitons are done take them out of the water and let them cool until you can handle them. 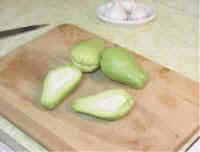 Remove the seed and scrape the pulp into a dish. Get as much of the pulp out as you can without puncturing the skin. Add the ground beef or shrimp to the sautéed vegetables and cook for about a minute. Add the mirleton pulp, mix well, add seasoning and green onions and mix well. Cook on a low fire for about 5 minutes. Taste to see what seasonings are needed. Let this rest for about 10 minutes. Turn the oven on 375ºF. Salt and pepper the inside of the mirleton shells. Spoon the stuffing into each shell; don't be afraid to overstuff them. Sprinkle bread crumbs over the mirlitons. 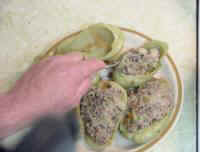 Place the mirliton shells in a baking pan or casserole. Bake them on the top rack in the oven for about 20 minutes or until the bread crumbs begin to brown. Stuffed Mirliton can be frozen for a short time (6 months). Prepare everything to the point of putting the bread crumbs on (leave them off). Wrap each mirliton tightly in plastic wrap and put them in a Zip-Lock, don't forget to put the date on it. You can also make a mirliton casserole by peeling the mirlitons with a potato peeler, slicing in half, removing the seed and using this same recipe.